My disclaimer for this recipe! I am Italian and during the holidays especially I make everything BIG! What if unexpected guests stop by! What if family brings a friend! What if I ran into someone at the grocery store and they are home alone for a holiday (that has really happened). These are some of the reasons there is always an extra dish waiting in the refrigerator on stand-by or when I make a dish - It's really BIG and LOADED with lots of good stuff. 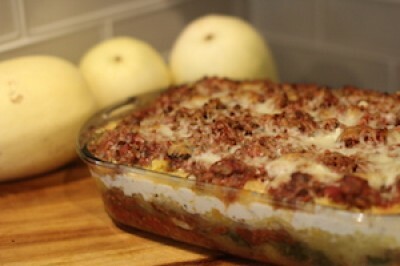 You can make this really big lasagna and left overs are amazing! You can cut ingredients in half to make an 8x10 size pan. You can make the meat sauce, cut the recipe in half and freeze the remaining sauce for another time. Preheat oven to 400 degrees F. Take spaghetti squash and poke about 8-10 holes by using a metal skewer and roast for 40 minutes. Remove and let cool. Reduce temperature to 350 degrees F.
Once the spaghetti squash is cool, slice in half and remove top layer and seeds. Use your fork and remove the strands into a bowl. Add in garlic and mushrooms. Let cook for about 5 minutes then add in crushed tomatoes. Season with parsley, basil, oregano and thyme. Stir and let simmer for about 15 minutes. Taste for any additional salt and pepper. Cover and simmer until ready to prepare lasagna. Put spinach in a large glass bowl and drizzle in a few tablespoons of water. Microwave for 1-2 minutes. Just until lightly wilted. Remove any liquid and set aside in the bowl. Add red pepper flakes and 1/2 teaspoon of salt and pepper. Add ricotta to a mixing bowl and whisk in 2 eggs until creamy. Season with 1 or 2 teaspoons of parsley. Take a 14 x 10 baking pan 2 inches in dept and ladle a layer of sauce to cover the bottom of the pan. Add in an even layer of spaghetti squash. Top with a layer using all of the spinach then cover with meat and mushroom sauce. (I like to use a slotted spoon to make it a very thick layer of meat and mushrooms. Then top with another layer of spaghetti squash. Top with an even layer of ricotta cheese. Top with the last layer of spaghetti squash. Add sauce to cover then add mozzarella and parmesan cheese. Bake for 45 minutes to 1 hour until bubbly and brown on top. I recommend you adding a baking sheet to the bottom of your baking pan The pan is very full. Let cool for a few minutes then slice and enjoy. Note: If you saved some sauce add a bowl to the table for extra sauce!